> What did I catch?! JedFinley has attached this picture to this report. The message is below. Posts: 3 Bit of a beginner. Been catching a ton of small brookies, but then I got this guy. Can't identify it, with the diamond shaped pattern. Some help would be great! Thanks! 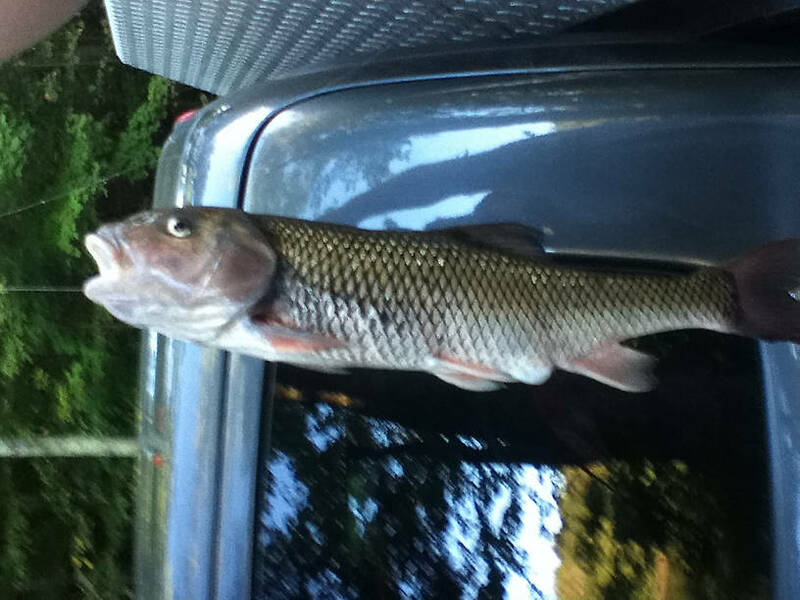 Posts: 3 The picture above is squished, but this fish was 15 or 16". Found that the body is that of a common carp, but the head looks like a trout to me. I thought it was a trout, but when I went to clean it, something wasn't right. Very bony, and seemed to have a rib cage like in the sunfish family. Posts: 374 I believe you have yourself a creek chub. A very big one at that if it's 15-16". Posts: 2345 Jed and Kyle, I believe this is one of those fallfish, a close but larger relative of the creek chub, in the same genus in fact (Semotilus). Too big to be a creek chub unless it's the new World Record, but Vermont is within the range of the fallfish which we do not get here in Michigan. Did it give you a good fight? Posts: 3 Awesome, thanks for the research. A fallfish it is. He put up a good fight considering I got him 2 ft off the bank, hanging out in a hole. Great day of fishing, river was very high, so everything I landed was within 8ft of the bank. 10 yearling trout, fallfish, and enough smallmouth to beat up my hands. Funny thing though, on wiki they mention the fallfish makes a gurgling sound when out of the water, which he was . . Sort of. He was actually honking at me, quite humorous. Beautiful fish though. 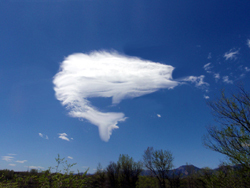 Posts: 1776 Jonathan's right; It's a fallfish. Mature ones like laminar flow of moderate current speed, almost always huggin bottom in the basins of runs, deeper pockets, and on the bottom in pools (at low water). Similar to mature rainbow trout, or whitefish (if you're a westerner you'd recognize such water), but warmer. When I start catching them I know I'm in marginal trout water, temperature-wise. They put on a nice first bolt, making your heart jump, but then they quickly seem to give up. They do get "big" relative to stream size. 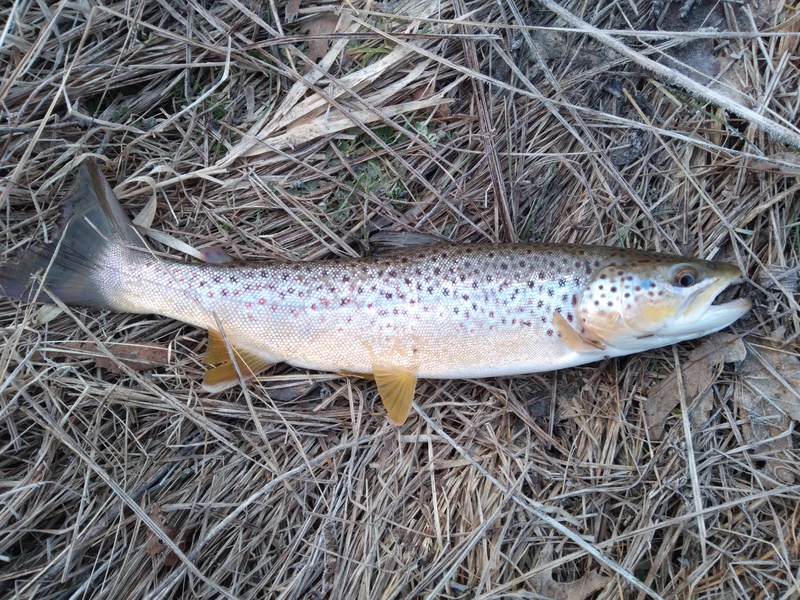 I've caught them to about 15" from medium sized creeks. The largest I've known of was a 19"er from the Delaware River caught by a friend. Posts: 2345 Our creek chubs (Semotilus atromaculatus, the fallfish is S. corporalis I believe) can get up to about 12 inches in optimum conditions. 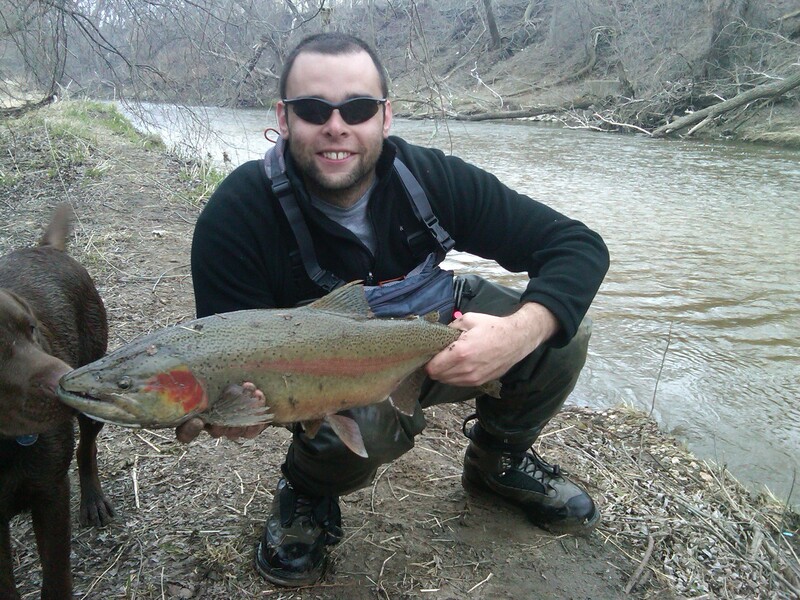 I did get one 8-incher a few weeks ago on the Pine River that put up a pretty good fight, actually thought it was a trout, and it was fairly colorful too. On Crane Creek in Missouri about 18 years ago (Labor Day weekend in fact!) I fed a #12 Gold-Ribbed Hare's Ear to a 10-inch hornyhead chub...this water was skinny and crystal-clear, and I could see a group of rainbows moving about in this stretch. They turned their noses up at the nymph, but then this rather differently-colored fish went after it...nice male with well-formed tubercles on his forehead as well as a nice red spot behind the eye, and fought well too. BTW I have several nice-sized and colorful individuals of this species (Nocomis biguttatus) living in my 55-gallon aquarium. The bigger minnows can give you a bit of a fight, but they don't have the intensity or stamina of a trout, nor are they as pretty. P.S. Creek chubs will talk to you too! Sort of sounds like they are choking. What are they saying? "Put me back in the water, I'm SUFFOCATING!!!" Re: A truly native fish!